Summary: The IoT is driving innovation in battery holder design and materials that make the choice of vendor and the security of your supply chain more critical than ever. 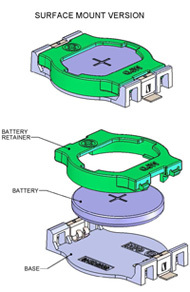 Battery holders are an often overlooked yet critical part of an electronic system, so much so that some designers and parts specifiers may leave it to subcontractors or other third parties to select the required part. With the Internet of Things driving demand for lower cost, the temptation only increases for those third parties to take short cuts with your design by using alternate sources or even unknowingly using counterfeit parts at lower cost. Caption: Smaller, lighter, and easier to use are the calling card of the Snap Dragon, the state of the art when it comes to coin-cell, battery-holder design. Ironically, the IoT is also driving the need for more innovative battery holder solutions that not only are more environmentally robust and reliable, but also are also more user friendly, especially for the elderly. Regulations around the latter make the choice of provider even more critical. If the wrong part gets into your design, whether by design or by accident, it may soon come back to haunt you and your company. We sat down with Thomas Blaha, President of Memory Protection Devices, Inc., to discuss the rising importance of the IoT, its effect on your choice of battery holders, and how you can ensure your battery holder supply chain is secure. Q: Tom, we’re seeing the Internet of Things affect almost everyone and every company: how do you see it affecting MPD and how your service your customers? A: Thomas Blaha: We’re seeing a lot of growth around tracking, communicating and security, particular in categories such as RFID tags, toll tags, Bluetooth receivers, bank security tokens, and smart locks for hotels and home automation. It’s just exploding. Q: Can you give an example of the use of battery holders in smart locks? A: Thomas Blaha: Sure, take hotels. They have two options when it comes to upgrading to smarter locks: hard wire the entire building and bring 120-V wire right to the door, through the frame, into the door, and go all the way to the handle. The other way is to put a battery holder in a replacement lock and just pop it in, and forget about it until maintenance just go through the whole building every six months and replace all the batteries. This saves an enormous amount of money. Q: Saving money is important for IoT systems, especially when it comes to connectors and even coin-cell battery holders: why not just get the lowest-cost part possible? A: Thomas Blaha: We’ve seen some people try that. They find vendors that sell a similar-looking part that costs less, but those vendors have “dumbed down” the metals and the plastics such that they deform under heat or lose electrical connectivity because they get pitted. Q: Can you give an example of where that happened? A: Definitely. We had a major server supplier selling servers all over the world and we were supplying the battery holders, made of nickel overlaid with gold. Then they dumbed it down and bought it for less, but it turned out to not be gold plated and didn’t use high-temperature plastic. When the server with the dumbed-down battery holder was placed in Egypt, Mexico or Singapore, or anywhere near the equator, it failed. And for what? The most they could have saved was 10% on a part costing $0.30 to $0.50: it’s not worth the risk, in terms of direct cost to fix the issues, as well potentially losing your customers’ trust. Q: So what makes MPD stand out in as a vendor and supplier? A: Thomas Blaha: Well, we were the inventor of the coin-cell battery holder in 1980, having partnered with a lithium battery developer, and have been out front ever since. We also have patent protection on some of our products. Q: What do those patents cover? A: Thomas Blaha: It’s about the design and the structure, such as how to capture the battery and how to connect to it. We started with a clean sheet of paper. People still try to copy our products but they don’t understand the design and they do it wrong. Q: How would a designer know it’s not the right quality? A: Thomas Blaha: You’d first start with documentation on shock testing, vibration testing, and accelerated aging. That’s always a good start. Then there’s markings: We once got a call from someone who bought counterfeit parts off of Ali Baba, thinking they were our products but they weren’t: they received “no brand” stuff that didn’t work. He started complaining to us and sent us photos. We simply pointed out that our logo was missing: All our parts are mint marked. These weren’t. Unfortunately, he already had product in the field that was failing. This all happened in two months. Only two months, and he’s got a nightmare. Q: Are there any other visuals to help customers avoid this “nightmare”? A: Thomas Blaha: They should look for things like excessive flashing and discoloration of the metal. Flashing is thin excess plastic that squeezes out along the mold seam and can prevent the battery from making a connection. It’s considered a contaminant. Also, check the spring on the contact. It should go back into place when you pull on it. Q: How are you continuing to innovate with battery holders? A: Thomas Blaha: We constantly get input from battery manufacturers and our regular clients. We see where they’re products are headed in the next five years and then we do our own internal research. Right now, we’re focused on making them thinner and smaller as the applications are demanding that. This means, for example, that the contacts move with the battery and the plastic takes care of capturing the battery, instead of relying upon a certain amount of metal to hold it in place. The thin contacts help avoid intermittent breaks in connectivity as they’re more flexible and respond faster when bumps occur: they stay with the battery. Q: This latter point would seem important for medical devices, does the FDA get involved? It’s a legal requirement in the U.S. that we make battery holders for medical devices easy to use: the elderly should not be troubled with a hard-to-take-out battery. Medical equipment makers understand that, but sometimes new staff comes in and they design something that doesn’t pass that test. They end up putting a battery down in a well, recessed, so you can’t see the shape and you can’t see the polarity markings. Then you hand it to the public. That’s not good. Designers should refer to FDA CFR 21, that’s the Bible around here. Q: What would be a good example of the latest in battery-holder design? A: Thomas Blaha: That would be the Snap Dragon: it’s a completely different animal to older technology. It’s tool-less for one thing. It involves a base piece and a snap-on cover. The battery goes on the cover and the plastic cover’s job is to keep the battery still and the contacts are free to move with the battery. To replace the battery you simply remove the clear top, exchange the battery, and you put the clear top back on. Older devices would have required a screwdriver.